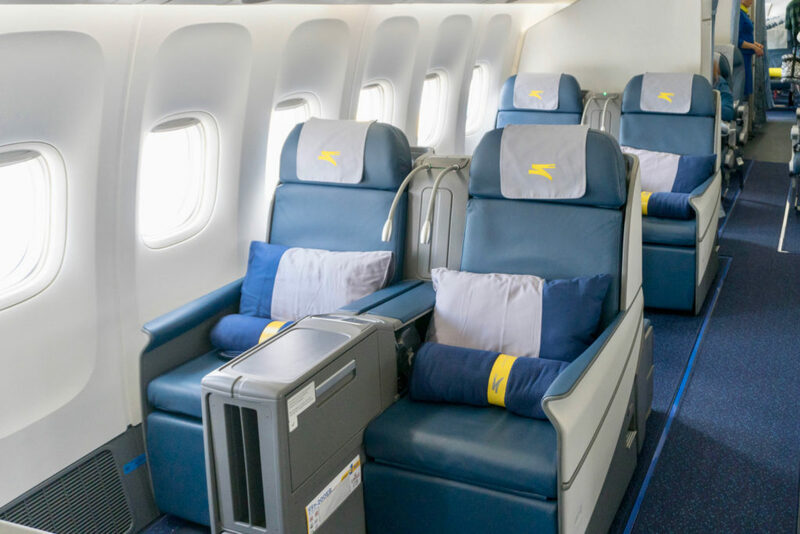 Ukraine International Airlines (UIA) received its first Boeing 777-200ER plane back in February 2018, and wasted no time to deploy the aircraft for its flights from Kyiv (KBP) to Bangkok (BKK) and Tel Aviv (TLV). UIA is one of the larger airlines that doesn’t really belong to any alliances—they operate over 1,000 flights a week out of Boryspil Airport in Kyiv, with a largely older aircraft with outdated cabin products. That’s perhaps why the airline is so proud to be taking delivery of the Boeing 777-200ER. Even though these aren’t brand new aircraft, it is still more modern than a good percentage of their fleet. The airline will eventually operate a total of 4 of these planes, and will offer 3 classes of service on the 777-200ER: Business Class, Premium Economy, and Economy Class. At any rate, UIA started flying the 777-200ER to New York (JFK) since March 25, 2018, and I have been waiting to try it out. I was on a jaunt to Eastern Europe, and found a cheap Business Class ticket from Warsaw (WAW) to New York via Kyiv. I figure it would allow me to sample both an older 737 Regional Business Class product, as well as the newer, now-flagship Business Class on their new 777. I wanted to share some brief notes on my experience. The Business Class hard product was actually fairly similar to Turkish Airlines’ long-haul Business Class. However, UIA has a relatively intimate cabin, with just 21 seats total. As you can see, the cabin is laid out in a 2-3-2 configuration, so there’s definitely no direct aisle access for everyone, and there is even a middle seat. However, the fact that all seats face the front straight on also means a slightly wider seat than most reverse herringbone product, which isn’t a bad thing. Ukraine International Airlines 777-200ER Business Class Cabin. Photo by the author. The individual IFE screen was nice, and certainly better than the shared TV playing videos on a loop on their older Boeing 767 aircraft. There was actually a pretty wide selection of movies, and a variety of TV shows, though most shows only had one episode. Each seat had a USB and power outlet, which helped with keeping devices charged. The plane was also supposed to have Wi-Fi, though it was marked as “unavailable” throughout the entire flight, and I couldn’t even view what Internet Plans they had. Ukraine International Airlines 777-200ER Business Class Seat. Photo by the author. The service is where I thought UIA really shines. Viktoriia, the flight attending working my aisle, was personable and attentive throughout the entire flight. The flight was off to a good start with a personal introduction and a welcome beverage. She brought over a selection, but did offer to bring my anything else I wanted. Ukraine International Airlines 777-200ER Business Class Welcome Beverage. Photo by the author. Contrary to what UIA’s video suggested, there was no menu for my flight. However, there were 2 choices for both appetizer courses. Yes…there were two appetizer courses each with 2 choices. I would call the first one an Amuse-bouche, but the portion was so large it certainly did not fit the definition. There were 3 choices for the main course, both for lunch (first meal) and dinner (pre-landing meal). The first meal was served on table (i.e. without a tray), while the second meal was served on a tray, but still course by course. Ukraine International Airlines 777-200ER Business Class Appetizer (#2). Photo by the author. The bed is marketed as a “lie flat bed,” but I would contend that isn’t entirely true. You see, the bottom half of the bed is full flat and parallel to the ground, though the upper half of the bed is at a slight angle, perhaps 160 – 170° if I had to venture a guess. So all in all, I didn’t have the sensation of constantly sliding off the bed like I would with an angled flat bed, but this bed is most certainly not fully flat. The bedding, on the other hand, was awesome. There was a mattress pad, a nice and big pillow, and a thick duvet plus a fleece blanket. It made for a cozy arrangement, and I managed to get some quality sleep on this 9.5-hour flight from Kyiv to New York. Ukraine International Airlines 777-200ER Business Class Bed. Photo by the author. I do have to point out one thing: the flight attendants left the lights on for the entire duration of the flight. I understand it’s largely a day time flight, but considering almost everybody was sleeping, it seemed a strange decision. Ukraine International Airlines’ Boeing 777-200ER. Photo by the author. Overall, I thought it was a nice flight, with service being the highlight. Thanks for the review! I’ve booked business on KBP-JFK for end of June and was waiting for any tips regarding their 777. Hope to see your full review soon. Hey, so where is the full review? I can’t find it!